Jockey Hugh Bowman has ridden Microphone to victory in the Group One ATC Sires’ Produce Stakes. 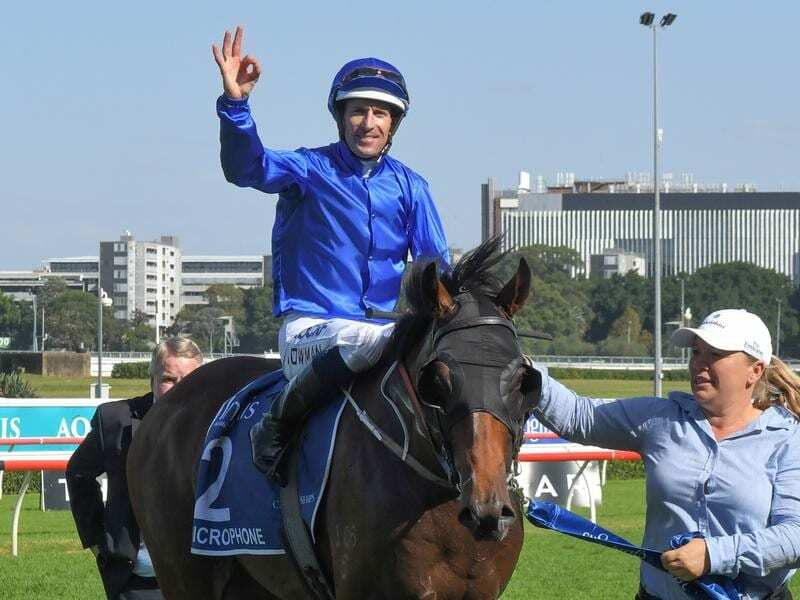 James Cummings has paid tribute to his legendary grandfather Bart after Microphone continued Godolphin’s clean sweep of the major juvenile races with a brilliant win in the Group One Sires’ Produce Stakes at Randwick. Microphone had to settle for second to stablemate Kiamichi in the Golden Slipper but on a better track on Saturday the colt had his moment in the sun. Cummings deflected praise for the stable’s incredible strike rate with two-year-olds this season and said it was a team effort by all the Godolphin staff. He also referenced his famous grandfather, who he worked under for several years before taking over the reins as Australian head trainer for Godolphin. “There’s not too many weeks go by that I don’t think about him,” Cummings said of Bart. “I’ve had the luxury of some of the best teachings that a horse trainer can get and I like to make the most of them. Microphone has been a model of consistency winning four of his six starts. Significantly, his success in the Sires’ has secured his future as a stallion and pushed his claims to the title of Australia’s best two-year-old. “I think his longevity, his campaign, his strength, his class, all those things point to him being the best two-year-old in the country this season,” Cummings said. Hugh Bowman settled Microphone ($4.60) behind the speed and chased down Kiamichi in the straight before holding off the late bid of favourite Loving Gaby by three-quarters of a length. Kiamichi and Castelvecchio dead-heated for third another half-head in arrears. Bowman said Microphone was a quality horse and expected him to be even better as he matured. “I will be surprised if he isn’t the best horse out of the Golden Slipper,” Bowman said. Cummings said he would see how Microphone came out of Saturday’s race before deciding whether he would press on to the final leg of the juvenile triple crown, the Group One Champagne Stakes (1600m) at Randwick on April 20.